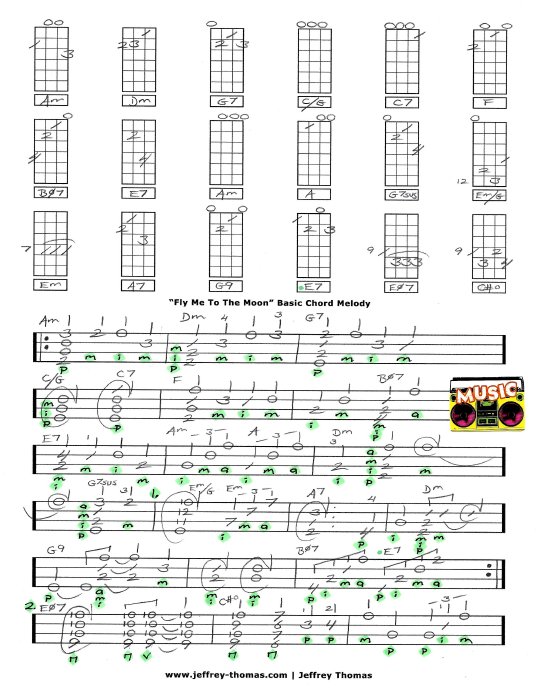 Fly Me To The Moon Free Ukulele Tab by Jeffrey Thomas. I have a nice chord melody here for you showing the melody very straight at first. Most of my ukulele students like learning it basic then they apply the swing feel to it. Frank Sinatra’s version is one of the best and it’s a good idea to check it out for phrasing. Want the full ukulele tab for free? Send in your email address using the for provided and I’ll send it to you. Looking for online ukulele lessons? Fill out the Schedule A Free Lesson form to set up your free Skype ukulele lesson today. Originally titled “In Other Words” the classic know as “Fly Me To The Moon” was written in 1954 by Bart Howard and Kaye Ballard. Find more great, free online ukulele tabs on my blog, video and tab pages.